The due date is less than 30 days away. We have been scrambling to get everything done for the arrival of our little girl. Keith’s sister, her wife and Keith’s mother threw a baby shower for me. It was fun! Jen even put food coloring in the cupcakes so they would be green, my favorite color. Karen (Jen’s wife) remembered that my favorite Disney Princess is Sleeping Beauty (Aurora/Briar Rose) and placed her on top of the cupcake tower. We played a game where people guess how big I am around my waist by cutting a length of yarn. This game is not for those ladies with weak self-esteem. Somebody guessed 74 inches. Just incase you need help with the math that is 6 feet, 2 inches around! I am big, but not quite that big! Our friend Storey took some maternity photos for us. It was so fun to work with her that way. She is a wonderful photographer and so comfortable to work with. We took some photos in her studio and some in Lower Bidwell Park. Keith and I are so thrilled with the photos way they turned out! You can see more photos from the shoot on Keith’s flickr page. We also wanted some pictures of the babe for our memory book and for fun. They can do 3d ultrasounds now. We have see her in 3d a few times throughout the pregnancy but since she is so close to being fully developed they look better now than they did at 16 weeks. 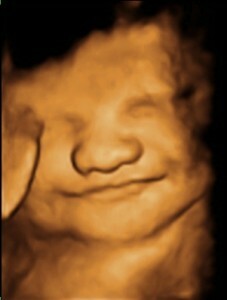 We discovered that she smiles, pouts and has a great grumpy face. She also loves to put her foot in her face. This habit is both amusing and disturbing. We have been going to the OB in Paradise every two weeks lately but that is about to change. We will be going weekly from now until the babe shows up. Good thing I like the drive to Paradise. We have been going to the birthing class. It has been helpful and very informative. It has also been the most terrifying educational experience I have ever had. I am glad we have been going, but I also have to wonder if birthing ignorance is bliss. One Response to She’s almost here! I am so incredibly happy for the two of you! I know Uppin will be brought into such a wonderuful loving home, and is lucky enough to have some of the most beautiful and amazing people I know for parents!! CONGRATULATIONS!! !